Introduction: Disease surveillance and notification (DSN) in Nigeria had been largely public sector driven. This study assessed knowledge and practice of the private health-care facilities in DSN and explored models for private sector engagement DSN of communicable diseases in Southwestern Nigeria. Materials and Methods: A descriptive cross-sectional study was carried out among medical directors of 60 private health-care facilities in Osun State, using a semi-structured self-administered questionnaire. Data were analyzed using the SPSS software version 17.0. Results: All the respondents have heard about DSN, while 80% had good knowledge of DSN. Thirty-two (53.3%) of facilities have ever notified the Local Government Authorities (LGA) health authority, 23 (38.3%) of facilities notified in the last 3 months, while 54 (90.0%) were willing to participate with government on DSN. Only 9 (15.0%) regularly share their disease prevalence data with government on monthly basis. Recommendations to circumvent listed barriers to public–private participation were suggested by the respondents. Predictors of a good notification practice include having good knowledge score of DSN, having received feedback from government or notified centers, and having a designated DSN officer. Conclusions: High awareness and knowledge but poor practices of DSN were recorded. Reasons for not reporting were surmountable while recommendations given were feasible toward engaging the private sector toward improvement of DSN in Nigeria. This is happening in an era of numerous country and regional level epidemics such as Ebola virus disease (EVD), Lassa fever, and numerous epidemic-prone diseases that call for urgent reporting of cases and subsequent public health actions. Although private hospitals are distributed in all geographical areas unlike government hospitals that are mostly urban and clustered based, the importance of the missing link of private hospitals cannot be overemphasized. Collaboration with government health systems is hampered by frequent intra-and inter-professional conflicts and strike actions that often paralyze government hospital activities from time to time, thus encouraging inconsistent epidemiological data management. The Government of Nigeria introduced the Integrated Disease Surveillance and Response (IDSR) program in 2005, with the objective of early outbreak detection and timely response. Under this initiative, health facilities and laboratories were required to report diseases either diagnosed or treated by them. While most efforts were public health facility based, the dominant role in the health service delivery inherent in private hospitals was underutilized through near-complete exclusion of the resources of the private sector to achieve public health goals. The author came across no local study assessing the rationale for poor reporting of diseases by the rapidly increasing number of private health-care facilities in Nigeria, yet pattern of disease notification has not practically improved in recent times. This study assessed attitude and practice of the private hospitals to disease notification and explored some models of collaboration that would encourage and engage private health-care services in disease notification of communicable diseases in Southwestern Nigeria. The study was carried out in Osun State, one of the six states in the South-West geopolitical zone of Nigeria. There are three levels of health care, namely the primary being managed by the local government, the secondary by the state government, and the tertiary by both the state and federal governments. The private hospitals provide essentially primary health-care services and are usually the first point of contact for most people with one medical condition or the other. The Association of General and Private Medical Practitioners do hold their annual conference and scientific meetings in each state and district, and this opportunity was used to conduct this research on disease surveillance and notification (DSN). About eighty-four private health facilities within the district were registered with the State Ministry of Health (SMoH). Private medical facilities attend to clients and are therefore expected to notify the diseases they see toward complementing DSN reporting system. This was a descriptive cross-sectional study and consists of private medical practitioners who were registered under the Association of General and Medical Practitioners of Nigeria (AGMPN) and the SMoH. Eligible respondent is the medical director of such registered hospital, who had been in service for at least 1 year. The opportunity created by the Association of General and Private Medical Practitioners holding their annual conference and scientific meetings at district level was used to carry out this study. A two-stage sampling method was adopted. There are three senatorial districts in Osun State. Two districts were selected using simple random sampling employing simple balloting in Stage 1. Questionnaires were equally allocated to each district. Each district holds a quarterly meeting of AGMPN, and the meeting provided an opportunity to reach these doctors at a forum. In Stage 2 and in a district, the attendance sheet of the doctors who were present at the meeting was obtained from the district AGMPN secretariat as a sample frame. A systematic sampling of one in three doctors on the attendance list was made after a random selection of the first name or subject. The sampled doctors were approached and recruited serially into the study once they gave consent for taking part in the study. Instrument used for data collection include semi-structured, self-administered and pre-tested questionnaires supervised by 2 trained research assistants. Pretesting was done among five eligible medical directors operating in Ekiti State, and the response was used to further modify the questionnaires. The questionnaire was also improved through vetting by two epidemiologists in Osun State. Questionnaires consist of sections on sociodemographic data of the medical directors and personal hospital data, knowledge, attitude, and practice of disease notification with reference to the operations of the hospital. A section of the questionnaire also dwelled on challenges facing private hospital participation in disease notification and model recommendation that could encourage private sector participation. Ethical approval to conduct the study was obtained from LAUTECH Teaching Hospital Research Ethics Committee. Further permission was taken from the organizers of the district level meetings while written informed consent was obtained from each of the medical directors who responded to the study instrument. Statistical analysis was done using the SPSS software version 17.0 (SPSS Inc, Chicago, IL, USA) after data cleaning. Accuracy of data entered was ensured by double-entry and random manual checks. Calculation of mean knowledge and attitude scores was done by pooling together relevant knowledge questions and scoring correct answer as + 1 and incorrect answers as −1. Scores above the average mark were considered as good while scores below the average were considered as poor. The Chi-square test and binary logistic regression model were used to explore association between selected categorical variables, and P ≤ 0.05 was considered statistically significant. [Table 1] showed that nine (15.0%) of respondents were primary care providers while 28 (46.6%) were secondary health service providers as statutorily registered by government. 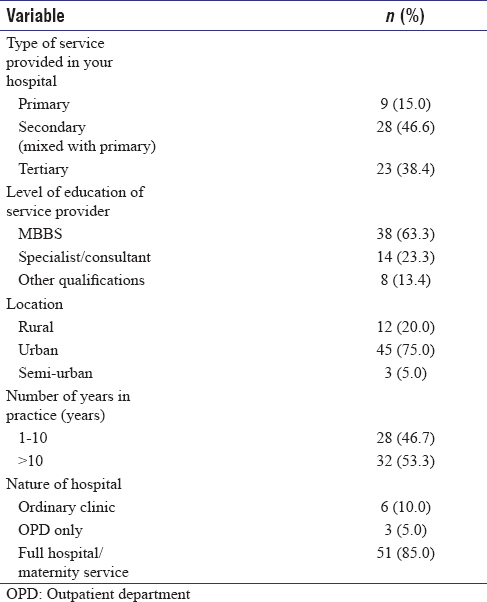 Thirty-eight (63.3%) had only MBBS degree, 14 (23.3%) were specialist, 45 (75.0%) provide services in the urban part of the study area, 28 (46.7%) had put <10 years in practice, while 51 (85.0%) operate full hospital services including maternity. [Table 2] showed that sixty (100.0%) have heard about DSN and described DSN as important for disease tracking and control. The characteristics of a good DSN system known to respondents include complete data reporting 17 (28.4%), timely data reporting 35 (53.3%), and regular data reporting 8 (13.3%). Forty-nine (81.7%) said that DSN is better done using appropriate forms while only 42 (70.0%) could name the DSN 001 and 002 forms. Twenty-six (46.3%) said that all diseases should be notified, and all respondents knew the correct route or channel of reporting of DSN. 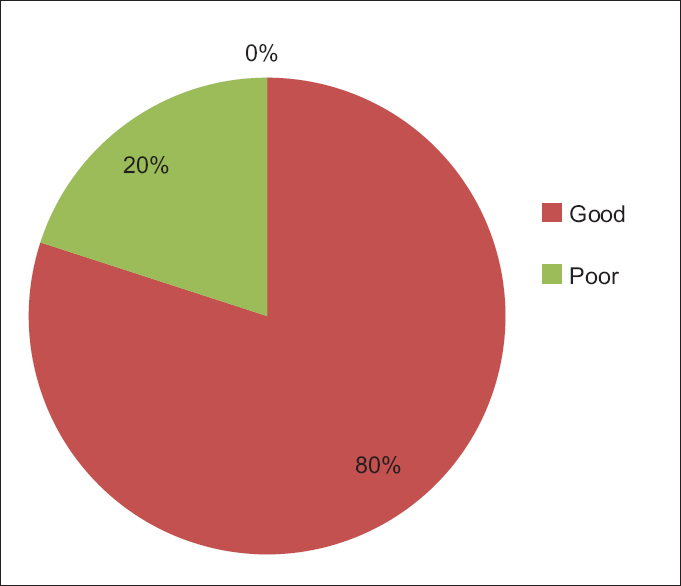 [Figure 1] is a pie chart showing that 80% of the respondents had good mean knowledge scores of DSN while 20% had poor mean knowledge scores. [Figure 2] showed that 32 (53.3%) of facilities have ever notified the LGA health authority or Medical Officer of Health (MoH), 23 (38.3%) of facilities notified the LGA health authority or MoH in the last 3 months, and 26 (43.3%) of facilities notified the LGA health authority or MoH in the last 6 months. Twelve (20.0%) had ever raised an alarm of an impending epidemic of a disease to government. Thirty-two (53.3%) had a record of all confirmed diagnoses made in their hospitals in the last 6 months, only 9 (15.0%) share these data with government on monthly basis, 23 (71.8%) of those who had ever notified received feedback from government or referral centers, while 54 (90.0%) were willing to participate with government on DSN. [Table 3] revealed the feeling of respondents as per several constraints that could militate against private sector involvement in regular DSN. These include poor knowledge of DSN by the authorities of private hospitals (25, 41.6%), inadequate supply of DSN tools (54, 90.0%), skilled workforce cannot be employed (21, 35.0%), and too many complex DSN forms (22, 36.6%), among others. [Table 4] revealed several recommendations made by respondents toward improving private sector participation in DSN. These include that government should always come to their facilities to pick up the data on monthly basis (58, 96.6%), sanctioning of health facilities found not reporting (51, 85.0%), and DSN officers to send reminders to the medical directors (57, 95.0%), among other recommendations. [Table 5] showed both bivariate and multivariate analyses with “ever-notified DSN” as the common denominator. 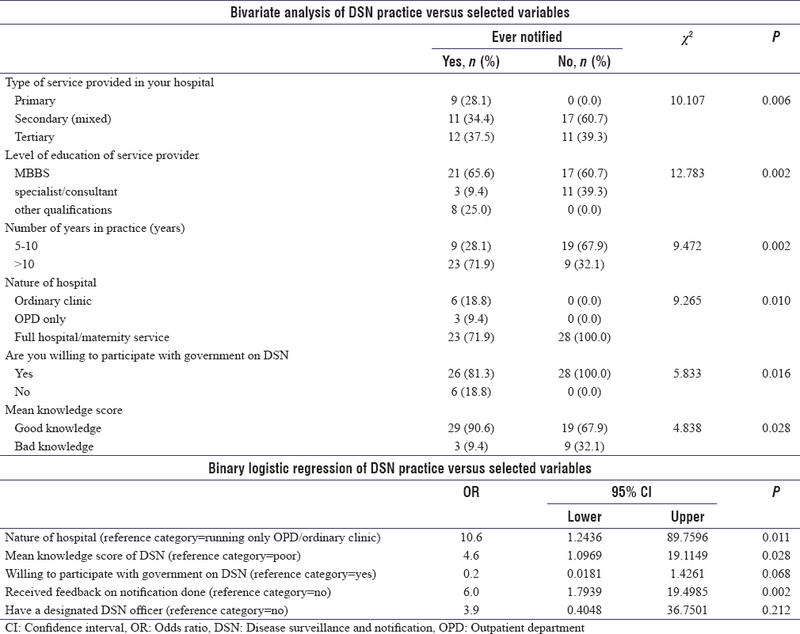 On bivariate analysis, a statistically significant association was found between the practice of DSN and types of services being provided, level of education of service provider, number of years put in practice, nature of the health facility, showing willingness to partner with government on DSN, and mean knowledge score of DSN (P < 0.05). On binary logistic regression analysis, health facilities with full compliments of services are about 10 times more likely to notify compared to health facilities that are just running outpatient clinics, and this observation was found to be statistically significant (odds ratio [OR]: 10.6, 95% confidence interval [CI]: 1.2436–89.7596, P = 0.011). Respondents with good mean knowledge score of DSN were about 5 times more likely to notify compared to respondents with poor mean score of DSN, and this observation was also found to be statistically significant (OR: 4.6, 95% CI: 1.0969–19.1149, P = 0.028). Showing willingness to participate with government on DSN could on a magnitude of about 5 times more likely to bring about disease notification compared to not showing willingness, though this observation was not statistically significant (OR: 0.2, 95% CI: 0.0181–1.4261, P = 0.068). Respondents with received feedback from the notified centers were about 6 times more likely to notify compared to respondents who did not received, and this observation was found to be statistically significant (OR: 6.0, 95% CI: 1.7939–19.4985, P = 0.002). Having a designated DSN officer was about 4 times more likely to bring about DSN of diseases compared to not having, and this observation was found to not to be statistically significant (OR: 3.9, 95% CI: 0.4048–36.7501, P = 0.212). Thus, predictors of a respondent doing DSN include running full hospital services, having good knowledge score of DSN, having received feedback from government or notified centers, and having a designated DSN officer. This study showed good awareness and knowledge of disease notification among respondents. Although only about half has ever notified, far fewer respondents shared their disease prevalence data with government regularly. Disease surveillance in Nigeria faced several challenges associated with a weak health system, nonclarity of the two-way flow of information among the appropriate authorities who need to know and lead to haphazard reporting and inconsistent data. 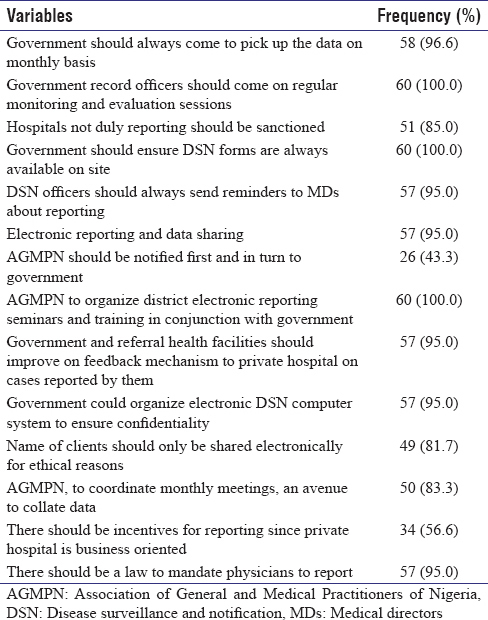 Respondents eventually gave some recommendations toward improving the DSN systems. All respondents in this study have heard about DSN and described DSN as important for disease tracking and control. This agreed with a similar study in which a great majority of respondents were aware of DSN. In another study among private health facilities, about two-thirds were aware of DSN while only one-fifth had in-depth knowledge of the reporting system. In another study, only fifty-five (38.2%) of the respondents were aware of the national disease surveillance system. The high response rates in our study compared to the other comparative studies could be because all our respondents were medical doctors, as they are most likely to have had one course or the other about surveillance systems during their university training. However, a good awareness could be an indication of willingness to obtain more detailed information about the subject matter of DSN and its practice. In our study, about four-fifth of the respondents had good mean knowledge scores of DSN while 20% had poor mean knowledge scores. In another study, barely, above half of the respondents (51.8%) had good mean knowledge of disease notification. The high knowledge recorded in our study could be as a result of the high awareness, because of recent health promotion and monitoring attempts by the Nigerian national surveillance systems to improve the weak surveillance systems and because of several recent epidemics being witnessed in the country, most especially the EVD outbreak of 2014 and the ongoing Lassa fever outbreaks. The 2014 EVD outbreak was the largest of its kind world over; disease surveillance and reporting was one of the public health strategies promoted that led to the timely containment of this disease outbreaks in Nigeria. Any knowledge gap in the DSN processes among directors of private hospitals and their subordinates could lead to their inability to detect and notify the occurrence of diseases that have high case fatality rates and are of public health-care importance. However, effective and timely public health responses to disease outbreak and health emergencies depend on the ability of the health system to provide accurate, up-to-date, reliable, and relevant health data, information, and feedback. Only about half of our respondents had ever notified the LGA health authority or MoH while only about one-third of facility notified the LGA health authority or MoH in the last 3 months. This is, however, better when compared to a study in which majority of respondents had a poor practice of DSN. However, our pattern is less encouraging compared to findings from another study in which about three quarters claimed to have ever reported. Our study, however, agreed foreign studies done among private health practitioners in which less than half had practiced DSN despite good awareness. It also agreed with another study where nearly 98% private medical practitioners felt importance of notification in health system, but only 46% had practiced it. Most common reason for nonreporting was lack of information about reporting system. The poor participation of the private sector could be due to the little attention placed on private hospitals during the introduction and implementation of IDSR strategy in Nigeria, and this points to the fact that government's stewardship role of the health system cannot be limited to public health facilities alone. Only one-third of our total respondents have ever received feedback on shared or notified prevalence data. This pattern or attribute is discouraging to the mechanism of the two-way referral process, but it is still better when compared to another study in which one-fifth received feedback from the higher facility to which referrals were made. It has also been reported that lack of feedback negatively affects reporting from health facilities resulting in underreporting of notifiable diseases. However, this study agreed with another study in which one-third of respondents received feedback from the higher facility to which referrals was made. Several reasons were given by our respondents as reasons for not reporting and as barriers to DSN in private health-care facilities. This agreed with other studiers, listing common problems associated with DSN system such as: lack of training, lack of transportation, poor motivation, inadequate supply of forms and other logistics, poor funding, ignorance on the part of the public, weak/inadequate supervision, and lack of prompt feedback among others. In another study, common reason for nonreporting was lack of information about reporting system. The predictors of DSN found in our study support the findings from some other studies,,, stressing the fact that recommendations made by our respondents as well as removal of stated barriers to DSN could bring about private sector participation in DSN in developing countries. Thus, a surveillance system can be described as a vital instrument in response to emerging and re-emerging disease and also an essential ingredient for evaluating the effectiveness of current health interventions and programs of a country. Rapid notification of infectious diseases is essential for prompt public health action and for monitoring of disease trends at the local, state, and national levels. Most of the constraints listed by respondents are surmountable, most especially the need for respondents to have in-depth knowledge of the process and the need for training. Most recommendations given to encourage private sector participation include the fact that government should lead the process of further integrating the private sector and providing an enabling environment for their full engagement in the national disease surveillance and reporting systems. Such collaborative strategy could ensure that the private sector completely, regularly, and timely reports cases of diseases that they see to the appropriate health authority. The authors wish to thank the medical directors of the private health-care facilities that took part in data collection. Eylenbosch WJ, Noah ND. Surveillance in health and disease. In: Last JM, editor. A Dictionary of Epidemiology. 4th ed. London: Oxford University; 2001. p. 175. Ratnendra RS, Ravindra SK, Jitesh SK, Tarun SK. To develop a public private partnership model of disease notification as a part of integrated disease surveillance project (IDSP) for private medical practitioners in Mumbai city, India. Global J Med Public Health 2011;1:1-11. Yoong J, Burger N, Spreng C, Sood N. Private sector participation and health system performance in Sub-Saharan Africa. PLoS One 2010;5:e13243. Bawa SB, Olumide EA, Umar US. The knowledge, attitude and practices of the reporting of notifiable diseases among health workers in Yobe state, Nigeria. Afr J Med Med Sci 2003;32:49-53. Federal Ministry of Health (FMoH). National Integrated Disease Surveillance and Response News of the Public Health Department Federal Ministry of Health, Abuja; 2002. Nnebue CC, Onwasigwe CN, Adogu PO, Onyeonoro UU. Awareness and knowledge of disease surveillance and notification by health-care workers and availability of facility records in Anambra state, Nigeria. Niger Med J 2012;53:220-5. Aniwada EC, Obionu CN. Disease surveillance and notification, knowledge and practice among private and public primary health care workers in Enugu state, Nigeria: A comparative study. Br J Med Med Res 2016;13:1-10. Awunor NS, Omuemu VO, Adam VY. Knowledge and practice of disease surveillance and notification among resident doctors in a tertiary health institution in Benin city: Implications for health systems strengthening. J Community Med Prim Health Care 2014;26:38-45. Nnebue CC, Onwasigwe CN, Ibeh CC, Adogu PO. 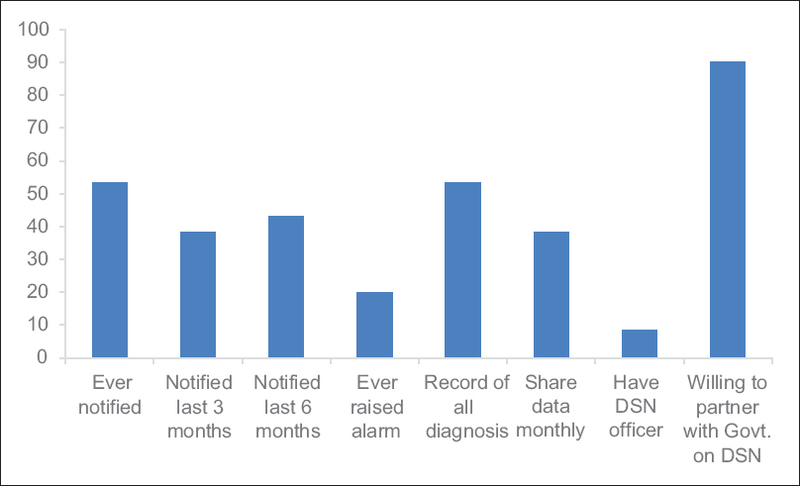 Effectiveness of data collection and information transmission process for disease notification in Anambra state, Nigeria. Niger J Clin Pract 2013;16:483-9. Adindu AU. The Effect of Incongruity on Quality of Health Information System: Bama Nigeria. Primary Health Care Case Study (dissertation). USA: University of Hull, 1995. Ndiaye SM, Quick L, Sanda O, Niandou S. The value of community participation in disease surveillance: A case study from Niger. Health Promot Int 2003;18:89-98.